Direct Lease Driver of the Month, Steve Jacks, Tipton, Ind., is a veteran driver with more than 30 years of experience as a professional household goods mover. Steve maintains an excellent performance rating. This is his second Driver of the Month award with the van line. Peter Castillo, Coast Valley Moving & Storage, Inc., San Clemente, Calif., earned Wheaton’s Permanent Fleet Driver of the Month award. Peter has more than 18 years of professional moving experience and maintains an excellent performance rating. This is his third Driver of the Month award with our company. 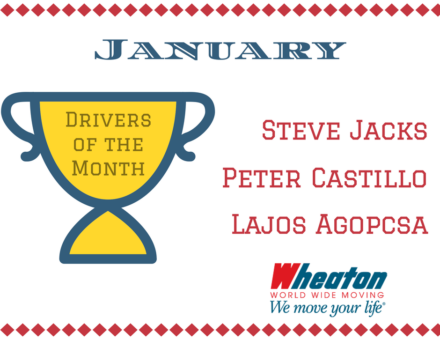 Lajos Agopcsa, Olympia Moving & Storage, Hyattsville, Md., earned Wheaton’s Intermittent Fleet Driver of the Month award. Lajos has six years of experience as a professional mover. He has an excellent performance rating and this is his first Driver of the Month award. For their efforts, each driver receives a cash award, plaque, Driver of the Month uniform patches and equipment decals. In addition, all are candidates for Driver of the Year recognition in 2018. Join us in congratulating each on their accomplishment.